Our growing collection of Cather papers and objects was enhanced recently with the addition of The Beatrix "Trix" Mizer Florance and Sidney R. Florance Collection, a group of letters written to Sidney and Beatrix Mizer Florance. A childhood friend of Cather who later studied music in Chicago, "Trix" Mizer Florance is one of several possible prototypes for Cather's Lucy Gayheart, making the addition of these letters especially important for scholars and enthusiasts. More than twenty-five letters, cards, and notes reveal their long friendship and their shared interest in music. Spanning more than 30 years, this collection of letters includes newspaper clippings of contemporaneous music reviews, news of Cather's work and famed acquaintances, and business correspondence between Cather and Sidney Florance. The letters between the two women show the warmth of their long-standing personal friendship, detailing illnesses and deaths, sharing small jokes, and expressing support. 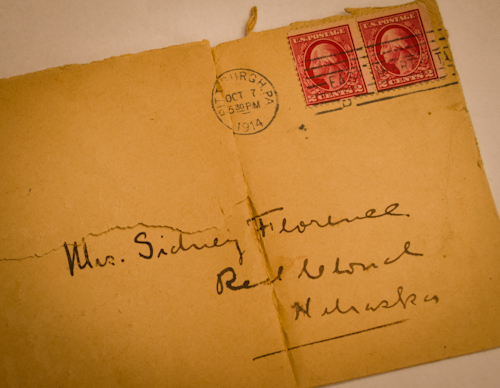 "I'm just terribly sorry—" Cather writes after learning of Mr. Florance's illness. "That's all we can do for each other in this queer world, be sorry or glad for our friends." Cather's beautiful prose shines through even the most perfunctory notes. "After almost seventy years, our family is pleased to donate this meaningful collection of letters to the Willa Cather Foundation. It seems only fitting they return to their original home in Red Cloud—for preservation and study in the National Willa Cather Center when it opens in 2016," said David Mousel. We are grateful to the Mousel family for making the care and study of these letters possible. Inquiries about the letters should be directed to Education Director, Tracy Tucker, at ttucker@willacather.org.